This painting by Jeffrey Smart, perhaps the finest masterpiece of his later years, is a perfect example of his habit of finding motifs delivered without warning. For, given the calculation and precision typifying his long career as an artist, Smart has never quite known what is in store to appeal to his compositional interests driving around the industrial estates of Arezzo, or walking through a flea market in Rome, or a back street in Sydney. His process has a curious connection with a 19th-century method inculcated by French artist Lecoq de Boisbaudran as a kind of competition with the seduction of photography. Students were encouraged to look at a motif for a few seconds, turn their backs on it, commit it to memory, and let imagination go to work. Whistler adopted this practice in France and England; and in Australia half a century later Nolan developed his own instinctive version of it to spectacular effect. Smart differed from those two however in his slow, deliberate construction of a scaffolding to hold fast a taken-by-surprise glimpse of a subject that to ordinary eyes may have had little significance. Indeed, often it is almost as if he has been the hunted and the motif the hunter, snaring him through the most unprepossessing effect; a slant of light on a garage door; a pattern of peeling posters on a corrugated fence; a red post box against a yellow wall. And always there have been moments of despair between these effects – moments of visual bankruptcy as he puts it – when he can find nothing to paint at all. Such was his state before the idea of 'Matisse at Ashford' made its first impact on him. At Posticcia Nuova his easel was bare, and there were only older sketches in the studio racks, nothing fresh coming at him for a new composition. Heavy with a cold in the late winter of 2005 he went to London for a business meeting, then on to Paris to meet up with Margaret Olley at the Louvre. He had to go back to London to finish his business talks, contemplating the ultimate return to a barren studio. The train pulled out of the tunnel in darkening afternoon light and 'Goddie came good' he later wrote to a friend, as it paused at the first English station, Ashford. 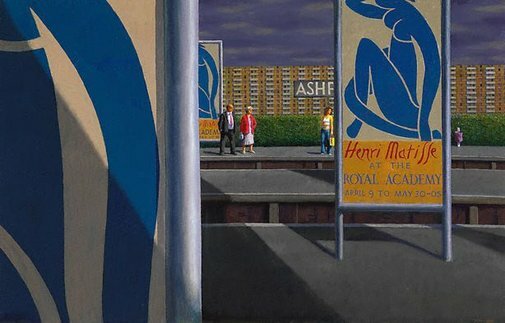 The platforms at Ashford were dominated by a series of posters advertising a Matisse exhibition at the Royal Academy – one of the blue cut-out nudes – seen in progression across the width of the station like echoing cadences of a modernist cliché. Smart didn't know quite why the motif was so imperative – why its visual irony was so eloquent – he just knew it had to be painted. Before the train moved off he quickly sketched what he saw with a black pen inside the end papers of a paperback novel and the masterpiece was in embryo, teased out and developed in the ensuing months through a succession of studies to its final bold, golden-section structure of verticals and horizontals. Its tight geometry and cool palette, true to the mood of season and time of day of its original inspiration, conspire to hold captive one of Matisse's most famous works as a magnificent specimen of that influence which helped set so many of the next generation of modernists free to roam the picture plane. Signed l.r.corner, red oil, "JEFFREY SMART". Not dated. Craig Bush, Look , 'Years of enrichment: The society reaches another milestone', pg. 12-15, Sydney, May 2009, 13. Renée Porter, Margaret Olley: painter, peer, mentor, muse , 'Margaret Olley: a celebration of life in paint', pg. 8-36, The Rocks, 2017, 86, 87 (colour illus. ), 115. Katrina Strickland, The Australian Financial Review , 'Odd lots: Smart wins accolade', Sydney, 12 Oct 2006. Jill Sykes, Look , 'Stopped at Ashford Station', pg. 14-15, Sydney, Dec 2006-Jan 2007, 14, 15 (colour illus.). David Thomas, Deutscher and Hackett Fine art auction: Melbourne Wednesday 31 August 2011 , Catalogue entry for Lot 10 Jeffrey Smart 'Second study for Matisse at Ashford', pg. 30-31, Woollahra, Aug 2011, 30. Look , Sydney, Mar 2007, 9. Look , Sydney, Feb 2007, 11. Look , Sydney, Nov 2007, 11. Art Gallery of New South Wales: highlights from the collection , Sydney, 2008, 106 (colour illus. ), 107 (colour illus., detail). The Art Newspaper , England, Sep 2006, (colour illus.). Australian Galleries Jeffrey Smart exhibition advertisement. Jeffrey Smart: paintings and studies 2004-2005 , Victoria, 2006, 6 (colour illus. ), 53. I blame Duchamp: my life's adventures in art , 'Jefrrey Smart: a man of great composure', pg. 179-190, Sydney, 2009, 183, 186-87 (colour illus. ).